(Nanowerk News) Using a new method for precisely controlling the deposition of carbon, researchers have demonstrated a technique for connecting multi-walled carbon nanotubes to the metallic pads of integrated circuits without the high interface resistance produced by traditional fabrication techniques. The technique could facilitate the integration of carbon nanotubes as interconnects in next-generation integrated circuits that use both silicon and carbon components. The research was supported by the Semiconductor Research Corporation, and in its early stages, by the National Science Foundation. The work was reported online October 4, 2012, by the journal IEEE Transactions on Nanotechnology ("Fabrication of an Ultra-Low-Resistance Ohmic Contact to MWCNT-Metal Interconnect using Graphitic Carbon by Electron Beam Induced Deposition (EBID)"). Georgia Tech researchers study data from their electron beam induced deposition (EBID) system. 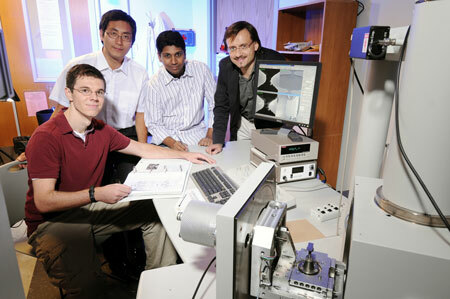 Shown (l-r) are graduate students Matthew Henry, Songkil Kim, Dhaval Kulkarni and Professor Andrei Fedorov.